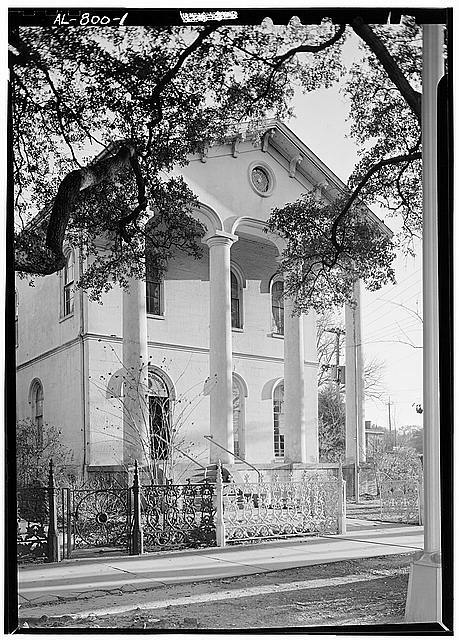 Church Street East Historic District was created by the Mobile City Commission in 1962 and placed on the National Register of Historic Places on December 16, 1971. Church Street East is bounded by Broad Street, Conti Street, Water Street, Clairborne Street and Canal Street. 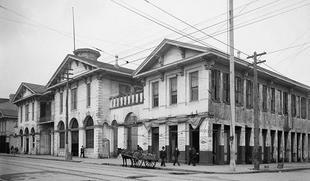 Following the great fires of 1839 which destroyed some 44 blocks of downtown Mobile, the area was rebuilt in a succession of architectural styles including Federal, Greek revival, Italianate, Queen Anne and Victorian. 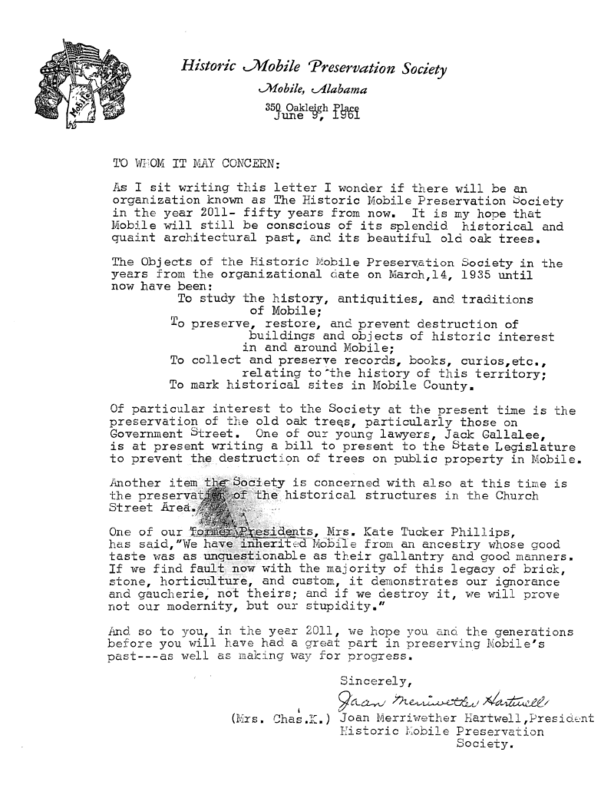 Letter contained in time capsule buried at Earnest F. Ladd Memorial Stadium June 1961 and opened October 2011 Ladd-Peebles Stadium. Unfortunately many historic structures were ultimately lost with the construction of the Municipal Auditorium in 1962. 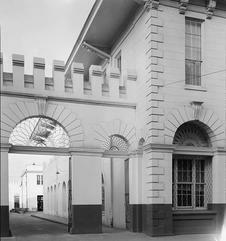 To Mobilians who have lived and trod the time worn streets, this upstanding building on Royal Street between Church and Government is known as the Old Southern Market. Built in the 1850's, this building was originally used as an armory and market place containing stalls which were rented to butchers, fish and vegetable vendors and grocers. After the Civil War, several of Mobile's municipal offices were moved to the upper floors of this building and it became known as City Hall. The wrought iron work that ornaments the delightful old arched doorways remains the most noteworthy example of ornamental iron in the city. The ground on which the enduring masonry of the old market stands is the exact site on which Bienville chose to build his Fort Louis de la Mobile in the year 1711. 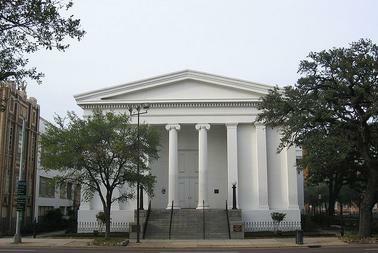 Designated a National Historic Landmark in 1992, Government Street Presbyterian Church represents one of the oldest, least altered Greek Revival church buildings in the United States. The sanctuary retains the original high backed walnut pews. In the early days the pews were privately rented and equipped with doors and individual locks. These were removed in 1893. Located on the corner of Government Street and Jackson construction began in 1836 and was completed at a cost between $60,000 and $70,000. Originally, the church contained a steeple that housed the city's first fire bell and a clock imported from Liverpool, England. The steeple was damaged in a storm in 1852 and never replaced. The clock was placed in the old Guard House Tower which once stood on St. Emanuel Street. Our tour of Church Street East starts at the corner of Church and Royal Streets at the Old Southern Market built in 1857. Built in the Italianate Style, note the delicate wrought iron work in the arches. Walk south on Royal Street to Theater Street and turn right to the Fort Conde-Charlotte House c. 1822,1850. 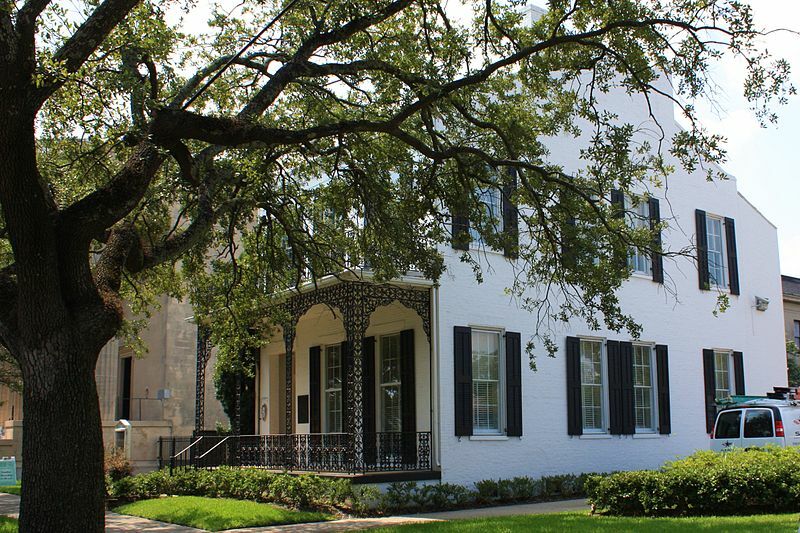 Originally constructed as Mobile's first Court House and Jail, it was converted into a charming residence by Jonathan Kirkbride around 1850. Remnants of the old jail including iron-barred windows and grilled doors may be found in the rear today. Turn left on St. Emanuel and you see the beautifully restored Hall-Ford Home c. 1836. Now the Fort Conde Inn, this lovely old place is one of Mobile's oldest residences and reflects so many of the characteristics of early domestic architecture found along the Gulf Coast. Return to Church Street and head west to Christ Episcopal Church c. 1838-1840. An outstanding example of Greek Revival style in Mobile, Protestants have been worshiping at this site since 1822. Continue west on Church Street to 350 Church Street, the Chandler House c. 1850. A Federal House with Greek Revival details, several motifs add variety to the cast iron of the galleries and fence. Directly behind the Chandler House sits the Waring "Texas" c. 1840. Named the Waring "Texas" because it was located far away from the main house just like Texas was separated from the rest of the Union. The Texas was occupied by the young sons of the Waring household. Between the Waring Texas and the main house were the Waring Quarters c. 1851. These slave quarters, still standing today, housed Moses Waring's 6 female and 3 male domestics on the top floor. The bottom floor handled the laundry for this large family. The Waring House c. 1846 had been located at 351 Government Street, but was demolished in the 1930's. Today it is a parking lot for the Carnival Museum. Continue west on Church Street to the Hamilton House c. 1859 located at 407 Church Street. This typical Federal townhouse is ornamented by a delicate cast ion veranda and remains a private residence. Turn north on S. Lawrence St to the Tardy Cottage c. 1858. Here we have the only surviving example of a raised Creole cottage in downtown Mobile today. 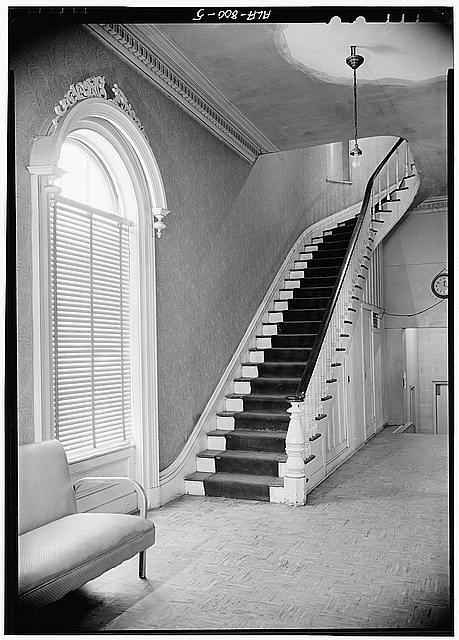 Unique in Mobile, note the double stairway to the gallery. Head north on S. Lawrence to Government Street. Looking to the right you see the Ketchum Mansion c. 1860. A fine example of Italianate building. Originally built for Confederate Major William Ketchum, it was commandeered by Union Forces in 1865 and they remained for the duration of the occupation. Looking to the left you see Barton Academy c.1836. This landmark of Old Mobile rears its venerable domed head through the maze of giant oaks. 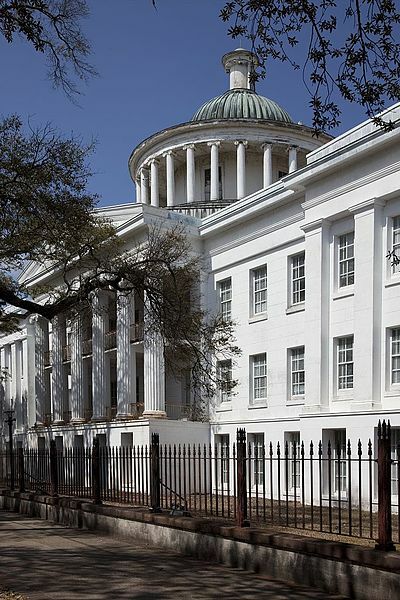 This impressive Greek Revival was home to the first public school in Alabama, and later served as an emergency hospital during the Civil War. Walk west on Government Street to the Admiral Semmes Home c. 1858 located at 802 Government Street. Presented to Confederate naval hero, Raphael Semmes in 1871 by popular subscription, he remained there until his death in 1877. Continue on west on Government Street to Bayou Street and head south to Big Zion A.M.E. Church c. 1868, 1896. 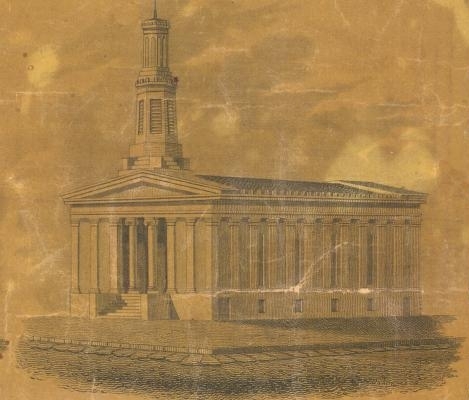 Formed in 1842 by a group of slaves who left what is now Government Street United Methodist Church. In 1865, Ferdinand Smith was ordained by Bishop J.J. Clinton – the first black elder ordained by a black bishop in the state. In 1896 stucco over brick was used to build the distinctive Romanesque Revival facade and steeple. Faith and perseverance has made this congregation an important spiritual and cultural center for over 170 years. Across from Big Zion notice the brick walls of Church Street Graveyard c. 1819-1899. When acquired in 1819, Church Street Graveyard lay one half mile beyond the city limits. Prominent individuals from Mobile's past are buried here, many in raised tombs. Return to Government Street and head east to Dearborn Street. On the corner of Dearborn Street rests the Kennedy House c. 1857. Built by Joshua Kennedy, the house remained in the family until 1923. 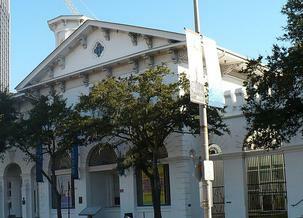 It then served as the Seaman's Bethel and later housed the America Legion. Winning the first Architectural Award presented by the Historic Mobile Preservation Society in 1950, the house is now in serious disrepair. From here we head south on Dearborn to Church Street and head East. At 602 Church Street we have the Farley House c. 1870. 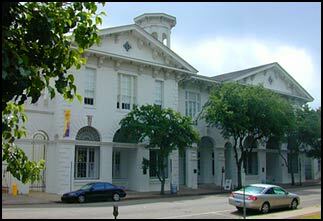 This compact Italianate townhouse remained a popular building form in post Civil War Mobile. It is one of the first houses saved from demolition by the Historic Districts Ordinance. Walk east on Church Street and turn right on S. Warren Street. 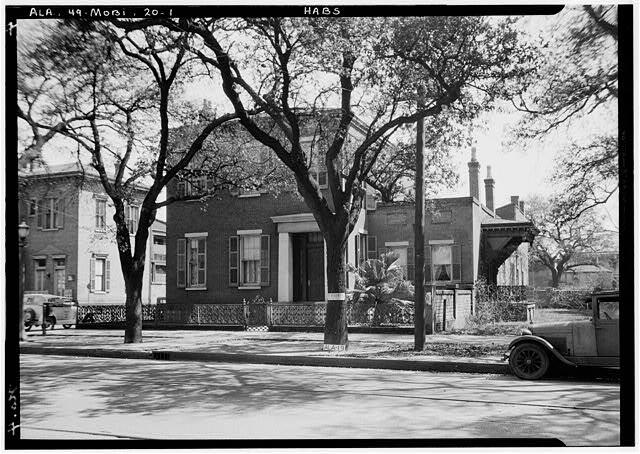 Head south to 201 S. Warren, the Bunker-Brunson House c. 1858, 1969. Originally resting at 157 Monroe Street this Federal style residence was to be demolished in 1968 to make way for the Wallace Tunnel. Thankfully, Judge Paul Brunson acquired the house and faithfully reconstructed the structure in 1969 at 201 S Warren where it remains a private residence today. Looking next door we have the Taber House c. 1850. Built by Archelaus Taber, a prominent Mobile house builder of former days, this pleasing example of a highly raised Creole cottage was one of the first renovations to be completed in Church Street East. Continue south on S. Warren to St. John's Episcopal Church Home for Orphans c.1869-1870 located at 208 S. Warren St. 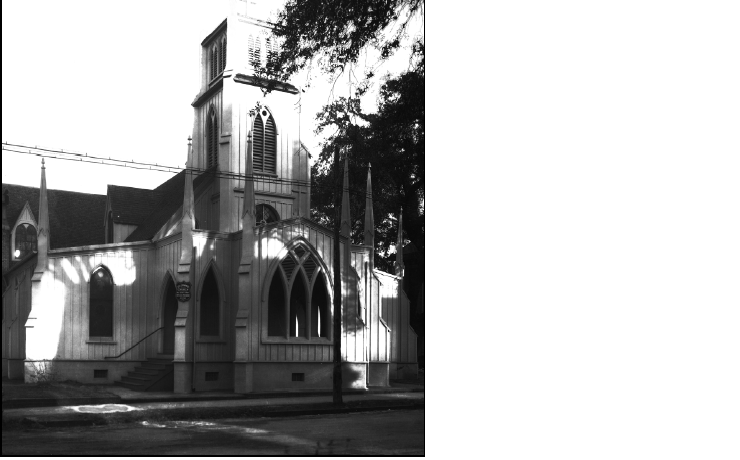 The third oldest Episcopal church in Mobile, St. Johns occupied the corner of Dearborn and Monroe Streets from 1853 until 1953. Comprising a church, rectory and orphanage, only the building you see here survives. The first floor of the orphanage functioned as a school while the second floor served as a dormitory. This area is now known as British Park at St. Johns, or more simply British Park. Continue south on Warren Street to Eslava Street. Looking west to 604 Eslava Street you see Widow's Row c. 1835. This housing was constructed by the Female Benevolent Society to care for indigent widows. Only two out of twelve units of that development survive. Head east on Eslava to S. Cedar Street and turn left. Heading north on S. Cedar we see small Victorian cottages and shotguns 1867-1910 predominate along these two block of Cedar Street between Eslava and Church Streets. These buildings are typical of much of the late 19th c. middle class housing stock that was present in the city. Stopping at the corner of S. Cedar and Church you see the Clemmons Cottage c. 1848 located at 551 Church Street. One of the older buildings in Church Street East, note the segmental arched window sashes in the dormers. The fire marker on the chimney indicates that this residence provided financial support to Mobile Hook and Ladder Company No. 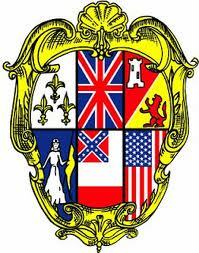 1 an all volunteer fire department that was located on St. Francis Street near Bienville Square. Turn right on Church Street and head east back to the Old Southern Market to complete our walking tour. It is interesting to note that in 1933 the Historic American Buildings Survey recorded 177 historically significant structures in Mobile. By 1973 more than two thirds of those buildings had vanished and only the photographs remain. In Church Street East, many were lost to make way for the construction of the Municipal Auditorium 1962-1964 and the Wallace Tunnel 1969-1973. Each building you have seen here tells a story of times gone by. Collectively they weave the fabric making up our shared southern experience. 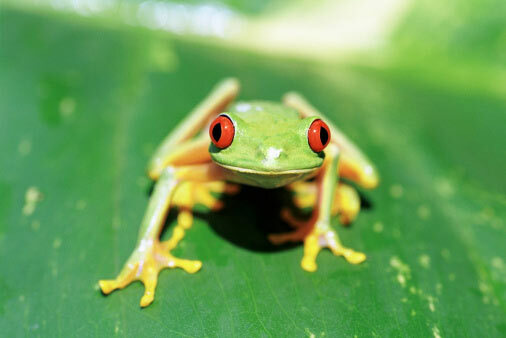 They will remain for future generations if we choose to preserve and protect them. There are ways to help. 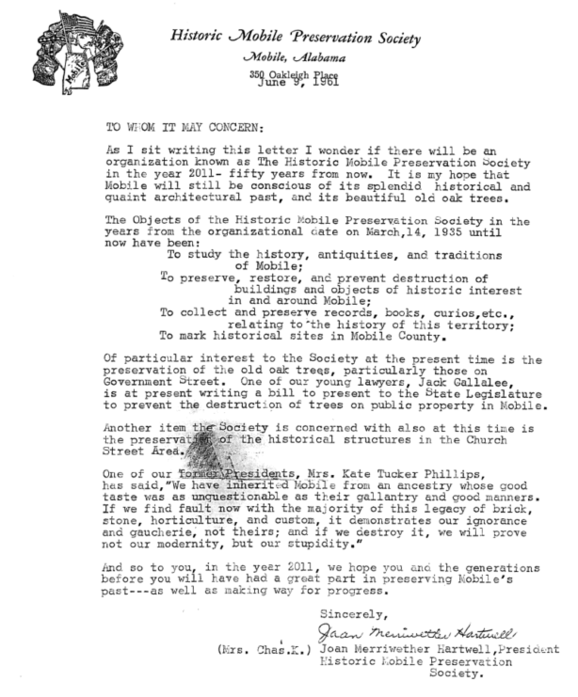 At the bottom of this page are links to the Historic Mobile Preservation Society and the Barton Academy Foundation. They need your financial support to help preserve our history. Please be generous. Church Street gets its name from the location of the first Protestant Church located outside the walls of Fort Louis de la Mobile. "Promenade Inglese" located at the corner of St. Emanuel and Church Streets has been a site of Protestant worship since Mobile's earliest days. 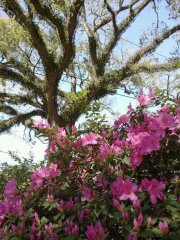 Junior League of Mobile, Alabama, Inc. Historic Mobile: An Illustrated Guide, Mobile, 1974. Mobile Historic Development Commission, 09/2002, Church Street East Historic District [Brochure], Mobile, Alabama. Sledge and Hagler. Cities of Silence: A guide to Mobile's Historic Cemeteries, Tuscaloosa: The University of Alabama Press, 2002. Thomason, Michael V. R. Mobile The New History of Alabama's First City, Tuscaloosa: The University of Alabama Press, 2001. For photographs click on the bold underlined portion of the description.